Clipping coupons can be worth the time, if you can find them when you need them. Here are some tips about keeping track of coupons. This is a guide about organizing coupons. I love coffee, and great deals while shopping, so I have tons of "frequent buyer" coffee punch cards, coupons, and gift cards. But with all of them just loose in my purse, it was a mess! Worse yet, when I would clean out my purse and leave some of the coupons or gift cards at home, I'd often be at a store and find a great deal, then realize I didn't have the coupon or card with me - it was at home! To solve this, I took an extra wallet that I had and put my coupons in the bill holder area, and gift cards and coffee punch cards (along with some other important ones) in the credit card area. Now I don't have to worry about running across a sale and not having a coupon or not getting credit for my latest cup of coffee! Finding things in my purse is much easier too! I keep my coupons in the car. That way if I am doing errands and decide to shop, I always have my coupons. This has worked especially well for me with coupons from Bed Bath and Beyond, Joann's, Michaels, and Hobby Lobby. Occasionally I have forgotten to use my coupons at the checkout only to remember them when I get home. I've started highlighting the items that I have coupons for on my shopping list with bright neon highlighters, that way they constantly jog my memory as I read my grocery list. We only eat out as a family if we have a coupon to do so. But keeping track of all those dining out coupons can be difficult. I created a coupon file just for this purpose. Using a small check organizer file, I labeled sections with titles such as: fast food, ice cream, pizza, buffet, diners, etc. There is even a section for entertainment (bowling, mini golf, movies). We keep this file in our car along with my grocery coupon file so we remember to use them before their expiration dates. This suggestion is about received email coupons for restaurants and grocery stores. To keep better track of which to use up first due to expiration dates, I forward them to my email addy with the name of the restaurant and the expiration date in the subject bar. When I get a Walgreen's Register Rewards coupon or an CVS store ECB coupon, etc. (ones that are usually high values) and I don't want to miss out on using before they expire, I put a brightly colored yard sale pricing dot on them and put them in my dollar bill slot in my wallet. When I find a coupon that I'd like to use, I put it with my grocery list that I keep clipped to the refrigerator until I'm ready to head to the store. I remember to use it when it's with my list that I check as I walk through the store to find my groceries. I purchased a small photo album that holds 3x5 inch photos. 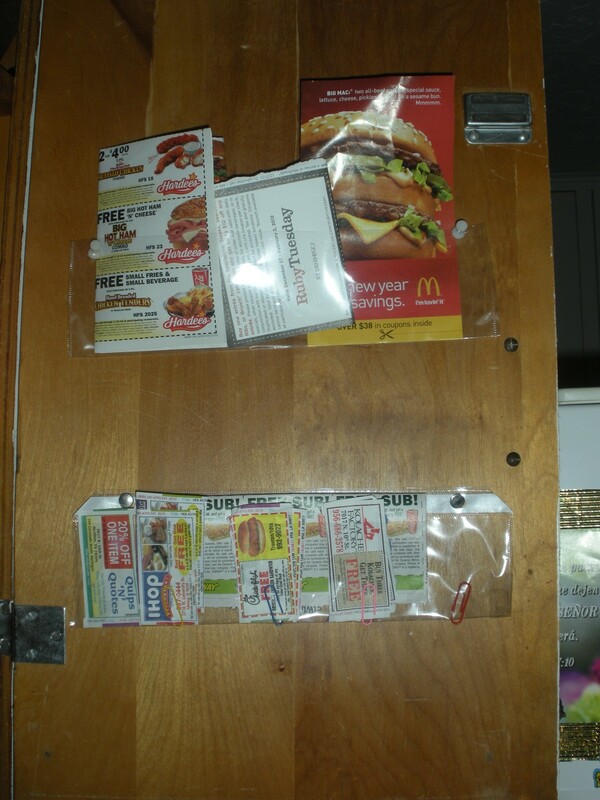 I use the clear double sided photo holders to place and organize my coupons so it's easy to thumb through at the store and goes easily in my purse. I was having a hard time keeping up with my coupons. So a friend of mine bought me a binder for my birthday, and I bought a pack of baseball card holder sleeves and a pack of dividers. On the rare occasions we eat out, I usually only remember to look for restaurant coupons when we are leaving. Since the coupons were not readily accessible, we failed to take advantage of them and let the coupons expire. I have a vinyl coupon sorter that is divided into categories (Grocery, Target, etc. and family members names and receipts awaiting reimbursement or rebates) Each time I purchase an item, I place the receipt in the corresponding file. 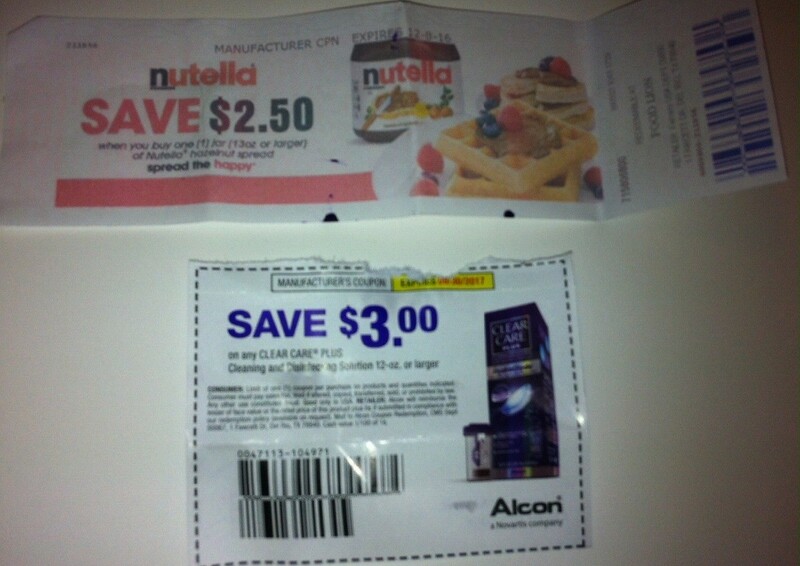 Instead of organizing your coupons by item, organize buy the aisle the item is found on. That way when you have a coupon you want to use, you don't have to go looking up and down the store looking for the item. This tip is for organizing store rainchecks and coupons. I try to get rainchecks each time I visit the grocery store, so I may purchase these out of stock products at my convenience, and maybe I have also found coupons by then. Everyone likes to save money, especially since a large portion of our earnings go toward bills. There are many ways to cut back and ensure we have a little extra to live off of. Two methods I utilize include couponing and store reward programs. I keep a coupon organizer in my car just for non-grocery coupons. I have fast food, nice restaurants, clothes, and other misc. stuff. That way when I am out and about, I always have my coupons close at hand, if we decide to stop for a meal or something. Finding the coupons by categories as they are set up in the little folders one can purchase caused too much fumbling and wasting of time as I was trying to find coupons for items that were on sale. I solved the problem by turning the section dividers around and changing them to alphabetical dividers with a felt-tip pen. On Sunday night, take out your store fliers from the newspaper to check for sales. Take an envelope and write on the back which products that you want, the size and the price. I stocked up on hair color and a toilet cleaning system and refills early this year when I had coupons, and they were on sale. On Sunday, cut out coupons from the paper and file them in a box for 3x5 inch index cards. You can bring this with you each time you go grocery shopping. Then if you see something on clearance, you have a coupon for. I receive many of my coupons through my email and digitally. However, several fast food establishments and restaurants still mail out paper savings flyers. To be honest, I have missed some great deals because I could not find the right coupon when I needed it. To remedy this, I decided to organize my deals in a small expanding coupon file. I think it's safe to say that most of us have, at some point or another, purchased an expensive time-keeping system such as a Day Timers. After the year runs out, we often store these on some shelf because we can't bear to part with the investment. I do not use many coupons. However, the ones I do keep, I kept forgetting when I went to the store. I found a way to help me. I simply tape the coupon on the item in the cupboard. I use a small tackle box for my coupons. It has a sturdy latch and handle. Use a basket on or near the door to collect coupons, outgoing mail, and items needed for errands. Then just grab the basket and go - you won't forget anything again! I am trying to save money on groceries by using coupons. I know to save coupons from the Sunday paper, but does anyone have any suggestions for other places to look or of any websites that have some? 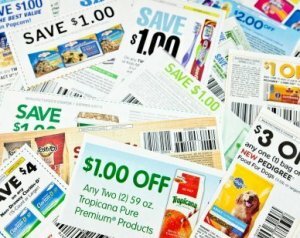 I'd also like to find more information on the web about knowing when to use coupons and the best ways to keep them organized. The prior advice is excellent; however through the years I've outgrown mine & now have 2 seperate plastic shoeboxes with dividers. One shoebox holds manufacture and store coupons for the grocers; the other holds entertainment coupons (restaurants, mall, recreation). My grocery coupons are set up by the rows of the store that I go to most often. You can save lots of $$$. Good luck. Besides the Sunday paper, ask neighbors who may not use them if you can have them. For your favorite products go to their individual sites for great offers. Hope the info helps. I took an old DayRunner I had from when I worked at IBM and used the larger index cards cut on an angle and taped to the dividers to make pockets. 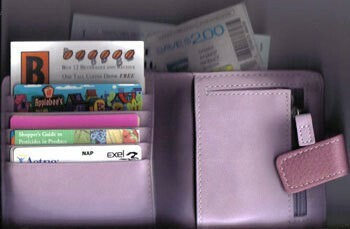 It zipps and has a place for all my reward cards, calculator, grocery list etc. I'm starting to become an avid coupon clipper. I've joined a coupon train and just purchased 150+ coupons on eBay for less than $6.00. Now, I'd love to learn a good, effective way to store/sort them in like a binder or something. Anyone have any ideas/suggestions? I'm just trying to save some money and get the most out of my coupons! Thanks. I like all the ideas especially the one using the CD holder. Thus far my "system" consists of two recycled envelopes, the size you get a large greeting card in, preferably coloured. I use two envelopes, one for grocery coupons and one for restaurant coupons. I keep them in the door storage slot in my car. Before I go into the grocery store I check the envelope. That's the time to edit the outdated ones. I may take coupons out and put them in my wallet or I may take the envelope in. I am a shift worker and like to grab a breakfast sandwich on the way home. I always have my coupons with me. Here are some common household items you can use to help keep your coupons organized.